CHICAGO, IL (February 16, 2015): Since indie toy company Warpo first entered the collectible toy market last year with a highly successful Kickstarter for their Legends of Cthulhu, 3.75" retro action figures, the next figure on the minds of toy enthusiasts has been a 12" Cthulhu, and that figure became a reality at Toy Fair this weekend as the paint master of 12" Cthulhu made its debut. The 12" Cthulhu will be the centerpiece of the Legends of Cthulhu collection, with pose-able wings, 9 points of articulation, and pliable "gripping hands", suited for grasping 3.75" action figures to their doom. The 12" Cthulhu figure will be packaged in an early 1980s-style, full-color box, featuring brand new artwork by the masterful artist Ken Kelly. CHICAGO, IL (February 10, 2015): From a successful Kickstarter less than a year ago, to toy stores across the country, Warpo is thrilled to announce the Legends of Cthulhu retro action figure line releases today. 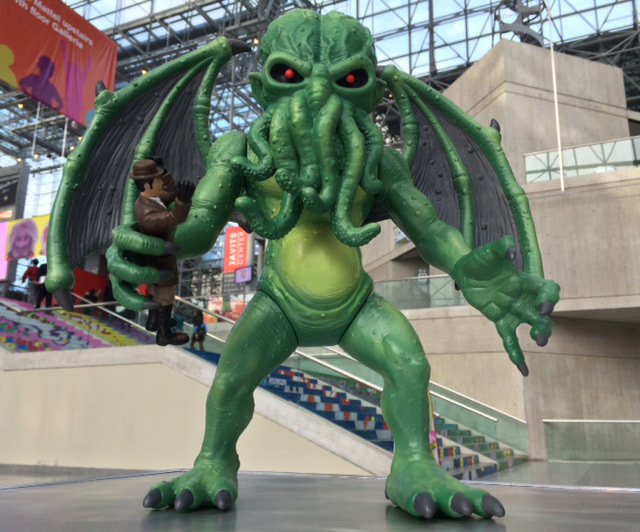 Legends of Cthulhu are the first action figures based on the world of H.P. Lovecraft, and include The Deep One, The Professor, The Cultist, and the Spawn of Cthulhu himself, each a 3.75", retro-styled action figure, sold separately (MSRP $19.99). "We can't thank enough everyone who supported the Legends of Cthulhu Kickstarter, and Warpo's vision to create a truly unique and authentic retro toy line," says Tommy Baldwin, VP of Product Development and Warpo co-Owner. "Fans of H.P. Lovecraft have waited a long time to have their elder god in toy form, and we are proud to have done justice to the worlds and characters."